Parallax WordPress themes are quite popular these days, because they look really professional and the eye catching design can easily attract any one. In this collection we have put together some of the best Parallax WordPress themes available currently, so if you are looking for one, check out this collection. Parallax Pro is one of the best release by StudioPress which is attractive and effective as far as performance is concerned. Created on popular Genesis Framework this theme is well optimized to ready to create a successful site. A fully responsive theme with 5 color styles, custom background and lot more options. Parallax is a single page WordPress theme from Themify, users of your site can enjoy your beautiful content in parallax scrolling sections. 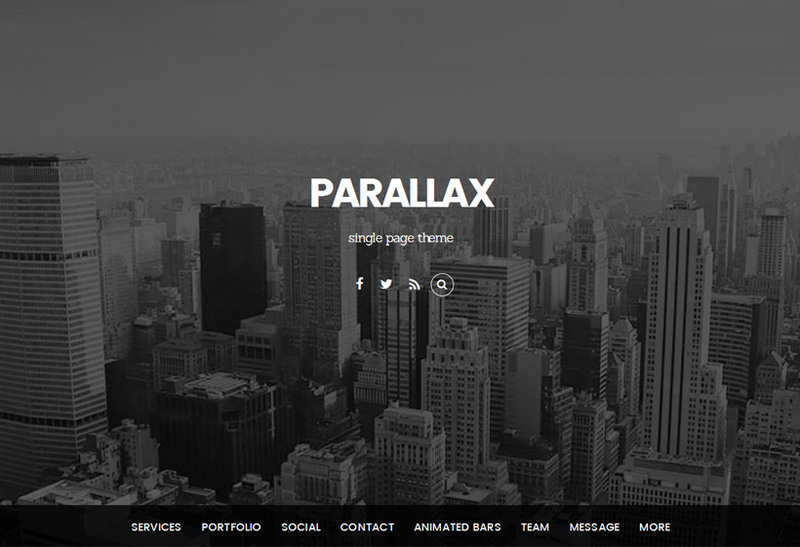 Parallax theme makes very good use of WordPress custom post type to bring in lot of useful features to this amazing theme. And you must have already heard about Themify’s drag and drop page builder which makes it really easy for any one to create a great looking page within minutes. Newave is another superb parallax WordPress themes, which is perfect for a corporate, agency, photography or general business. Some of the important features of this theme are: 6 Home Sections, Background Video Support, Parallax Slider, Fullscreen slider, Ultra-responsive, 4 Navigation styles, customizable backgrounds(colors,images or patterns), Font Awesome icons and many more super-awesome features to keep you busy & satisfied. Make is a really good looking parallax WordPress theme, a fully responsive & retina ready theme which is perfect for a corporate site or any other business website. It is built with Bootstrap and well coded so very easy to edit and change things. You can modify layout, styling, colors directly from within the backend. RockoX is a great one page parallax WordPress theme, this theme comes with multiple dark and light layouts also included in this theme with lots of CSS and JQuery animations, a perfect theme for web studio and creative agencies. Well optimized codes makes this theme SEO friendly and comes with nice documentation to help your create a great site. Wunderkind a really good looking Parallax WordPress themes created on Bootstrap 3.1. framework. 4 home page options to choose from, free web fonts and lots more. Eight Degree is a great looking single page parallax theme. Perfect for corporate, agencies, freelancers or small business. Any element can be parallaxed with eight degree, using the powerful animation shortcode generator. BizNex from TeslaThemes is another superb Parallax WordPress themes, which is a great option to create a Personal page, blog, portfolio, business, creative agency. Additional pages can be easily created with the existing elements, there are predefined pages already created. This theme is powered by amazing Tesla Framework which comes with tons of options to help you make an outstanding site on WordPress. Jarvis is an amazing one page parallax WordPress theme suitable for corporate, agency, nonprofit, freelancer or general business. You have 9 Home page options to choose from, Light and Dark Skins, Customized Color/Gradient Skins, Ultra-responsive, 2 Navigation styles, fully customizable backgrounds(colors,images or patterns), Font Awesome icons and many more super-awesome features to keep you busy & satisfied. Status is another superb parallax WordPress themes with modular and fully responsive layout. Theme is suited for business or portfolio websites. Theme includes lots of advanced features and functions and is based on solid backend framework. Mercurial is one of the best Parallax WordPress themes, this one page WordPress theme comes with pre-made custom shortcodes, you will be able to create beautiful typographic effects, insert portfolios, skill bars, clients logos, social sharing icons, awesome sliders, pricing tables, build up incredible team pages, or even add your twitter feed in just seconds. QuickStep is a clean and minimal one page portfolio Parallax theme. It uses CSS3 to responsively adapt to different screen widths so it looks good on any device. Athletica is a Retina ready Parallax OnePage WordPress WooCommerce enabled Theme with a clean and professional design which will be a great solution for your business, portfolio, blog or any other purpose. Athletica is a fully responsive WordPress theme with 6 type of homepage layout & more than 10 other page templates. Passage is a super multi-purpose retina-ready parallax WordPress theme. Each page of this theme can have it’s own custom header with different height and background image or slider. SouthCentral is a great looking clean, modern and minimal One-Page parallax WordPress theme for corporate, agency, photography or general business. SouthCentral Theme includes everything you need to build something exceptional. Wisten is a fully responsive One Page template. Wisten is powered with Twitter Bootstrap 3.0 Framework. It is perfect for creative agencies, digital studios personal freelancers, photographers. Parasponsive is one of the best looking parallax WordPress themes which is a WooCommerce theme with number of options to create a great site on WordPress. SwagMoment a very attractive, colorful parallax WordPress themes, a fully responsive WordPress theme with HTML5 & CSS3, retina ready and packed with number of options. Alpine is modern professional and flexible one page parallax responsive multi-purpose WordPress theme, developed in Bootstrap framework with great attention to details. Theme can be used for any type of website like business, corporate, portfolio, products, marketing, etc. You can modify layout, styling, colors directly from within the backend. Eleven is one of the best parallax WordPress themes which is a One Page Template with Parallax Effect. Is very easy to customize it. This template is great for creative, digital agency, photography, business, corporate. Modern and clean style. Zoo is the ultimate single page parallax theme. Perfect for corporate, agencies, freelancers or small business. Any element can be parallaxed with zoo, using the powerful animation shortcode generator. North is a fully responsive and parallax one page WordPress theme. North is powered with Twitter Bootstrap 3.2 Framework. 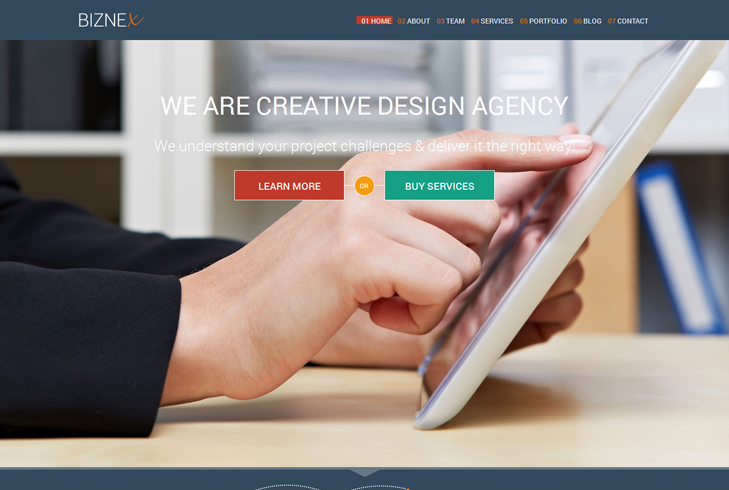 It is clean and professional theme perfect for agencies and creative studios. JKreativ is ultra multi purpose, super responsive, SEO Optimized WordPress Theme with highly customizable feature. You can create very beautiful photography website, classic villa or hotel website, interior or architecture, creative, or practically this themes fit with any kind of business. Vizard is a modern parallax WordPress theme for advanced users, it comes with limited support. A beautiful responsive WordPress theme with some amazing options. You can create and save page builder layouts, also you can import/export layouts. Starky Responsive One Page Parallax Theme. Starky is clean and modern theme suited for various use one page website for your portfolio and business use. Atrium is another amazing parallax WordPress themes, which is a fully responsive one page WordPress theme built with Twitter Bootstrap framework. Just One is an amazing parallax WordPress theme with some great features, a fully responsive design, Retina Ready, Ultra-High Resolution Graphic, Includes a Sticky Header for more advanced usability. Lana is one of the best parallax WordPress themes, it looks spectacular and comes with custom page builder, a fully responsive design simple , clean Bootstrap 3 based , responsive , retina ready, 2 menu types and infinite sortable sections,multi-site ready, guaranteed free lifetime updates. X Theme 2.0: What’s new? Super clean list of themes here. Will share it for you.